AT this point, roughly 80% of all email databases are considered to be “inactive.” These dormant subscribers have stopped engaging with your emails, and have been silent for months. As you would expect, this inactivity adversely affects both your email list and revenue. Fortunately, there is a solution. Website and business owners can kick their subscribers back into gear with marketing automation. With this software, you’ll be able to leverage marketing automation in order to turn your inactive subscribers into loyal, spending customers. The demand for marketing automation software is rapidly growing within all industries and business niches. Technavio, a tech-focused global research firm, recently reported the global marketing technology market is expected to grow at a compound annual growth rate (CAGR) of 11.9% from 2015 – 2019. Many people get marketing automation and email marketing mixed up, probably because both of them are email-centric. While both of them rely on email for their primary mode of communication, email marketing is simply the foundation block that marketing automation branches off from. Marketing automation involves using software that automates the marketing tasks your business has to conduct on a regular basis. Some of these tasks include customer segmentation, data analysis and reporting, visitor tracking, customer data integration, and marketing campaign management. By implementing marketing automation into your business, tasks that would have otherwise taken up a big chunk of time are done in a more efficient, faster manner. Rather than sending out a couple hundred emails per day, the marketing team of your business is able to send out thousands in less than a few hours. This makes it possible for your business to devote more time to revenue practices, such as sales, in-store signage, and various forms of advertising. With marketing automation software, you’re not just limited to sending out a single email for your campaign. Instead, you can design several different campaigns that are tailored to the needs of your customers, and then send those campaigns out in a whole series of emails. By doing this, you can send an initial email to just a small segment of your list, such as the inactive subscribers you’re trying to wake up. Whenever one of your subscribers completes an action, such as clicking through a link within the email, or downloading attached content, they will receive a triggered email. This email is different from the one that gets sent to the subscribers who didn’t take any action, and serves as a convenient way for you to measure and track the actions of both types of subscribers. Being able to track and analyze the behaviors of your prospects and customers gives your business valuable insight into their interests, needs, and even their purchase history. Major sites like LinkedIn and big eCommerce sites, like Amazon, do this quite often. They track the items or profiles their users view, and tailor their content and emails accordingly. This keeps the information contained within these ads or emails relevant and of interest to their prospect, which increases the likelihood of them being opened and read. With email marketing, you are very limited in what you have power over. If one of your subscribers isn’t ready to purchase your products or services, there isn’t much you can do. Sending them an onslaught of emails won’t do a single bit of good if they don’t have enough incentive to spend their money. However, marketing automation creates a customer-brand relationship that leads to you gaining your prospects’ trust and, ultimately, their sales. Marketing automation makes it possible to continually engage with your subscribers, and lets you know when they are ready to make a purchase. When the customer takes a specific action, the marketing automation software notifies you so that you can engage them accordingly. Rather than your business coming across as pushy and having too much of a sales angle, you foster and nurture a lead and are able to guide that customer through the entire buying process. Rather than just blindly emailing the exact same thing to everyone on your list, boost the relevance of each email by segmenting your list. This also increases engagement. In fact, HubSpot claims segmenting their emails resulted in a click through rate of 6.4%, which is roughly 166% higher than the industry benchmark of 2.4%. It’s best to collect the data at the time of lead generation, but you can also use social media platforms like Twitter and Facebook to collect data. For instance, you can market with third-party contest apps on Facebook as a way to gather the information. Once you have the data you are looking for, use an email management tool to make managing segmented email campaigns even easier. Most businesses tend to send out welcoming, appreciation, and transactional emails. Direct marketing emails, such as sales announcements, follow close behind in terms of popularity. They aren’t quite as popular with recipients, though. Open and bounce rates vary greatly by industry, as well, so it’s important to take that into account. If you are in the Agriculture and Food Services or Architecture and Construction industries, you can probably plan on having a higher open rate (25.06% & 249.2%, respectively). If you are a vitamin supplement company, however, you’re probably going to have a lower open rate (17.7%). Take these numbers into account, and then step up the game even further by sending out trigger-based transactional emails to wake up your dormant subscribers. These are incredibly effective types of emails because they are centered on the customer, rather than on your business. People prefer to read things that are relevant to them, and triggered emails are exactly that. Because triggered emails use a first name in the subject line. This may be a simple tactic, but it’s highly effective. Sending out personalized, triggered emails one of the top email marketing trends of 2016. In fact, a great many analytical and marketing companies maintain click-through rates are far higher when the customer’s first name is used in the subject line. MailChimp research also states that including a city name within the subject line is even more effective. Including the customer’s first name and/or city in the subject line will get the email opened, but make sure it’s read and clicked-through by including the customer’s name in the email content as well. Increase your lead nurturing and promote trust by adding your own first name and the name of your company. This adds a more personal feel to your content, which creates a customer-brand relationship. It’s far better to show you are human, than to remain a faceless organization without any authentic voice to your brand. In fact, a recent study conducted by Experience Marketing Services shows personalized, triggered emails increased the average open rates by 25%, unique click rates by 6.7%, and revenue per email by 63%. Additionally, transaction rates more than doubled. 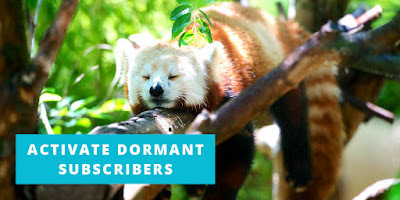 Want to wake up your dormant subscribers, and get them to take action? Include a Call to Action (CTA) in your email content! Optimizing your CTA gets you the results you’re looking for. In fact, protocol80, Inc. recently cited data from WordStream, which reported that emails with a single call-to-action actually increased clicks 371% and sales by a staggering 1617%. Placement is important, so your CTA should be highly visible and placed above-the-fold in your email content. Keep in mind, though, that the fold could be the first 600 px for a desktop email, but less than that for a webmail or mobile email. Not everyone has a full screen window, and may have a different browser width. Your designer should be able to help you figure out the best placement. A sense of personalization makes the customer feel as though they will miss out on a business that truly cares about their needs, should they not follow your CTA. A sense of generosity makes them feel like they will lose out on a great gift, if they opt to not follow your CTA. Finally, the sense of urgency makes them feel like they will lose out on something great, if they do not immediately follow your CTA. No matter which feeling you are trying to invoke, those are three words that increase conversions. By having a strong brand voice, and keeping a consistent voice and feel from the initial email to your landing page, you will facilitate trust and brand-customer engagement. This is the type of thing that leads to a boost in sales. By keeping your content consistent and aligned, your customer will feel secure in their decision to click through to your page. They will know they clicked the correct link, and that they navigated their way to the right page. Making the sales funnel easier for your prospect is the easiest way to activate your sleepy subscribers and create conversions. Make sure to include a consistent visual design, as well as strong copy that reflects your voice. Your brand’s voice should be coherent and consistent throughout all of your content, from the initial email to your website’s landing page. Send out your campaign subject lines to at least three segments in your email subscriber list. Check out your views, the opens, and the click-throughs. Which subject lines got you the best conversions? Send those out to your segmented subscriber lists. A/B testing gives you an idea of which wording, designs, and images work best for converting your prospects and nurturing your leads. Use this testing to refine your content, hone your sales funnel, and boost your sales. Use a tracking system to find out and compare the results of your email campaigns. Did one of them drop in views or clicks? Why? Did one of them see a sudden spike in opens? Why? Marketing automation has become one of the most popular software systems for business owners and marketing specialists. Not only does this type of software allow you to manage all of your data, but it also helps you create a solid profile of your prospects and current customers. With marketing automation, business owners can send out personalized, relevant emails at the right time to move prospects along through the sales funnel. Not only that, but it also helps business owners and marketers better understand their subscribers, so they can incentivize the inactive subscribers to take action. It also sends the business owner alerts, so they are aware when the prospect is ready to make a purchase. Marketing automation optimizes marketing and business procedures, and makes it easier for business owners to figure out what works, what needs a bit of tweaking, and what should just be tossed out. Marketing automation results in nurtured, which leads to a boost in sales. By use marketing automation software, and you’ll be able to activate your dormant subscribers and will see a significant increase in profits. Have you used marketing automation software before? What type of outcome did you see? Let us know in the comments below! #DIGITAL: Is Your List Dead? Learn How to Activate Subscribers!